It's your data, it's worth its weight in gold, and you should have the ability to extract it and use it. Here's a few more reasons to incorporate both TIMS Software and Noah for a complete practice management software for your busy audiology clinic. Noah data is stored and maintained inside of TIMS software. 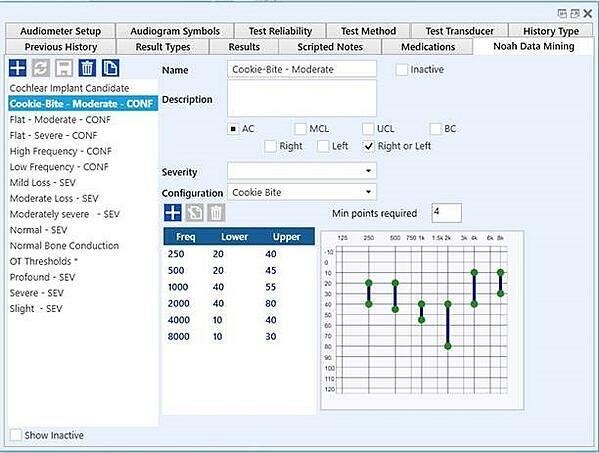 It's easy to access, analyze, and find specific audiogram data elements. Search configurations and severity's with the Noah Data Mining Setup screen. Your Noah data is immediately searchable which means that anyone at your practice, whether experienced or new, can easily begin using Noah to match configurations of loss with possible new devices that are designed specifically to meet the needs of patients with those exact configurations. Once you include your severity and configurations, Noah provides a list of similar severity within minutes. You can then market specifically to those patients. Integration with the TIMS Communications Center means you can create your own customized marketing pieces and print or email them to patients. In addition, every interaction is archived and quickly retrievable from your patient record. Here is a link to Part 1 of this blog series, in case you missed it. See What You've Been Missing. Schedule a Demo Today.